World History Detective Book 1 , Ancient and Medieval Civilizations is an impressive, over an inch thick, workbook from The Critical Thinking Co. The target ages were stated to be 6-12+. I thought it would be a good fit for our 8th grader to focus in on some history reading this spring. I spent time reading the easy to understand Teacher Overview. One thing was clear – there was a combination of goals that could be met by using this text. As I assumed from the company – Critical Thinking – Making Children Better Problem-Solvers would be the first goal. Since we will be looking at 8th grade testing, this was of interest to me this spring. 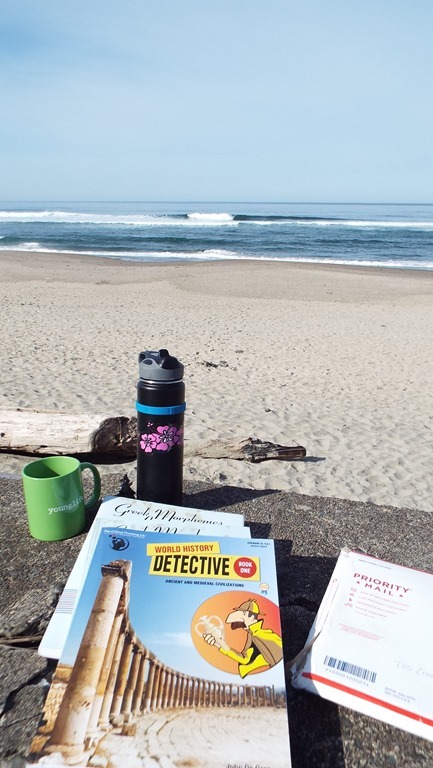 We use a lot of audio books, narrations, field guides, research on the internet, etc. We do not do text book reading / answering direct questions in our normal day. This is a book on the Ancient and Medieval Civilizations, so the second emphasis is on Social Studies / History. If used as a whole course, the state social studies standards for grades 6-7 would be met. There are 78 time periods covered – all over the globe. We are praying for friends traveling in Jerusalem and Europe right now. 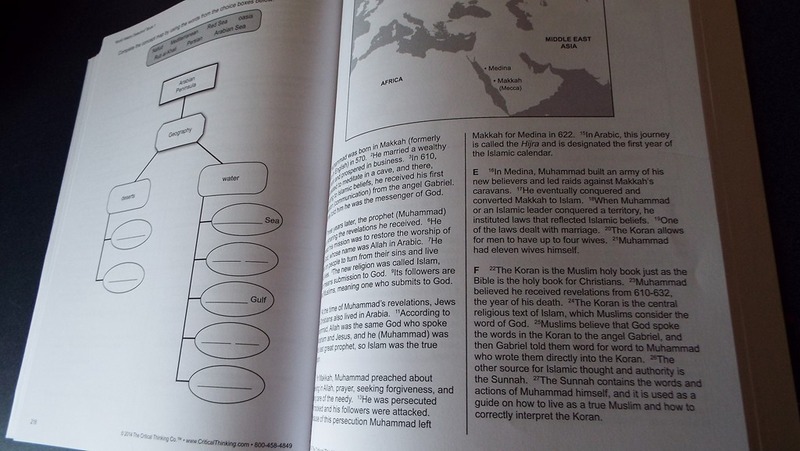 Based on family questions, we started on lesson 53 – The Beginnings of Islam. We moved through the Spread of Islam: The Caliphs, Medieval Islamic Science, Math, Business, and Literature, Medieval Islamic Art and Architecture, the Decline of the Islamic Empire and the Seljuk and Ottoman Turks. We may move into the Geography of Asia next, or jump into another time period. After reading the paragraphs, the student moves on to the questions. Some of the questions ask, “Which sentence best supports the answer?” I like that it pushes them not to guess, but to know. Some times there is more than one sentence as well. The questions are not cookie cutter: The Red Alder tree grew near the river. Q-What kind of tree? Where did it grow? There are true and false questions, of “Do you think?” and what sentence supports your answer. Rich with history and geography. The next step is a Written Response Question. For Example, “Based on the lesson, why do some Muslims believe that Christianity and Judaism are not the correct way to worship God? Please use complete sentences to answer the question.” They are given a full page, half ruled, half blank to answer. We never did write these out, but we read the question aloud and used it for conversations. It is intended for High School Level skill sets. The next pages were work book graphs/charts/fill in the blanks to help cement the lesson. We used the workbook once a week at home, and then carried it with us as we were on our errands, surfing, work projects, etc. Some times it took one day to read half the lesson, then another day for the second half. Some times, due to so much information, we’d spend 2-3 days re-reading the information. Working through the questions seemed to help him focus on the comprehension to the greater detail. We’ve done narration and copywork to keep focused, but this too, at times can become routine, without thinking. Parroting back without really understanding. I asked Jon today if he had anything to share about the book. He did the lessons willingly and without complaint – and that always says a lot for company. Instead of the Award Winning sticker on the front, they should be able to say “Jon Didn’t Complain.” Ha. Anyway – He said he didn’t really like all of the work of finding the sentences, but he learned a lot about the Muslims, Sunnis, Shiites, and Dynasties – it must have been good. He was asked several times of the past few weeks what he was studying (still not sure if public school kids get asked as often) and he was able to answer in pretty great detail. (whew). My hope was that he’d have an understanding to the passion of what is going on around the world, and it did seem to give understanding. I read through several other lessons to get a feel for them. It is very factual based. This happened, and then that happened. Like a reporter. They have quite a few cultures / religions/ peoples represented. There is no favoritsm from what I could see. All peoples from the Ancient and Medieval Civilizations are represented equally. Folks seem to want to know if this is a “Secular” history book or a “Christian” history book. I’d say it is neither. It is a Critical Thinking Co. book – here are the facts – now what do YOU think. I like that. I do not believe that any section that I read was intended to sway the reader one way or the other to choose a side, but to learn about all of the civilizations. We will continue to carry this in the backpack for a while! For the goal of Critical Thinking, and looking at History Factually – this is a great product. I was surprised that Jon read it without complaint as we are used to more of the living book style of learning history. This is why I love doing reviews – I get to step outside of our normal mode and try new things. I am glad we tried this one! Google + : The Critical Thinking Co. This entry was posted in History, Reviews, Schoolhouse Crew and tagged critical thinking The Critical Thinking Co., CriticalThinking.com, criticalthinks, History, HomeSchool, hsreview, hsreviews, Making Children Better Problem-Solvers. Bookmark the permalink. I chose not to review this, but we love having textbooks on our bookshelf for the kids to read for fun and this looks like one my oldest would love!